Sammy Hart is thrilled to be teaching at MOVE Wellness Studios and to learn more about movement and alignment from the diverse group of teachers and trainers at the studio. Though she discovered yoga in high school, it wasn’t until 2010 that she truly fell in love with the practice. Since then,Sammy has studied under those she most wants to emulate, including her mentor YuMee Chung and an advanced training with Ana Forrest this past September. 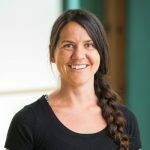 You’ll find her classes are a distinct blend of creative flows, core and breath work, with music and philosophy scattered throughout to really help her students connect to their bodies safely. She looks forward to seeing you at MOVE Wellness Studios.